The workplace is not a level playing field. Not a place of equals. Not a uptopia of fairness and equality. It mirrors life and the world around us. We are not all the same. We don’t all have equal power, status or influence. We are so often at the mercy of others. No matter where we work – no matter how flat the organisational structure; how little hierarchy and job title is said to matter – there is always a power dynamic at play. Everyone has a boss. And your boss answers to someone. Their boss. The board. The shareholders. The markets. The regulator. The media. The public. Nobody is beyond accountability or management. Not even in owner-run businesses, where there is often a figurehead – an entrepreneur – who built the business from nothing and who controls everything that moves within it. There is always someone there to speak truth unto power – even if that truth comes from outside and unwelcome voices. The fall from grace of high profile individuals who acted like dictators in their own businesses shows that even the mighty – the seemingly untouchable – are eventually held to account. The court of public opinion can render damning and costly verdicts. It can ruin reputations in days, where they took years to build. Why is this important in discussing the third principle of work-life balance? What has this got to do with you and your job; your battle to achieve the right work-life balance for you? As with all things, context is everything. We all must understand and work within the constraints of the context and landscapes in which we operate. We are not islands. We do not work alone; even when we work for ourselves. We all have clients. Customers. Stakeholders. Audiences. I set the scene in this way to say that I understand that we can’t always say and do what we would like at work; we have managers we must manage; egos to massage; performance and pay reviews to negotiate. It means we have to moderate our language and behaviour at work to fit in; to stay on the right side of authority; to keep our heads below the parapet. This is a learned behaviour we develop from an early age. From school. From our childhood – when we begin to understand what actions get rewarded and which get punished. We learn to say “please” and “thank you” at our parents knee. We learn to say “yes” on command. We learn to comply. We learnt to please. This learning – this hard-wired, ingrained way of operating – of fitting it; of getting along with folk; of rubbing along; of keeping our heads down and keeping people on board; is what often leads us to a damaging default position at work. The default of saying “yes” to most – if not all – requests that are made of us. Stop for a second now and think about your last day at work. Think about how many emails from your manager or supervisor you received or questions or requests that were made of you in meetings or in casual conversation. How many times did you say yes? Or more to the point, how many times did you say no? How many times did you say yes but wanted to say no? I hazard a guess that you wanted to say no, a lot. Not to be difficult but because you already had more work than you can reasonably manage; you had personal commitments you wanted to meet; children to play with at home; dogs to walk; relatives to visit; gyms to attend; music to listen to; TV to watch; downtime to enjoy; shopping to do; food to cook; gardens to enjoy; time for you to savour. You want to say no because you’re already starting to feel a little – or a lot – overwhelmed by your workload; perhaps feeling under pressure; maybe experiencing some of the physical symptoms of stress and anxiety. You could be sweating at your desk or on the way into the office; feeling a pain or heaviness in your chest; having waves of nausea even though you are not unwell; struggling at times to get your breath; having occasional or regular panic attacks; finding yourself emotional in unusual situations, including in the office; you are tearing up at inopportune moments (although you‘ve become good at pretending it is early hay fever or a watery eye that has been bothering you for a while); you might have a cold or sore throat you can’t shake off; your hands make shake a little; you feel cold a lot of the time; you have a itchy rash on your legs, arms or all over your body; your bowel movements are loose and you got the toilet more often than you used to; you have frequent headaches; you find it hard to concentrate; you’ve lost some confidence; you just don’t feel like you. In short, life at work is harder than it used to be – and most certainly harder than it should be. As, even in the greatest careers and organisations, it is only a job. It is not your whole life. It does not – it should not – define you and the value in place in yourself or perceive others to place in you. It is work. It is paid employment. It is not you. These symptoms are those of someone who is saying yes too often and as a result has an unmanageable workload and an imbalanced life. Stress at work is often the result of taking on too much stuff; saying yes too often; so that the Jenga pieces are about to tumble over. I know these symptoms well; they describe my daily life for years. They remind me with a shiver how I lived. They were my daily reality. But it doesn’t have to be like this. There is a different way. You can be more honest at work and be more yourself and kinder to yourself. You can start this by just saying “sorry, no”. Not all the time – not to every request – but when the time is right. When you get asked to stay late one time too many; when you get asked to cover yet another meeting for someone else; when you get asked to pick up one more project or task on top of an already full to-do list; when you are asked to take on that extra (often unpaid) role or responsibility which will eat into your home time for no benefit to you; when you get asked can you work at the weekend or attend another meeting that starts before 9am or after 4:30pm; when you get asked again to just do more when you are already doing too much; when you have to skip lunch again (after already skipping breakfast because you were rushing to get into work on time) to go to another meeting. When you are already running at 100% and being asked for a little more; for the X Factor magical 110%. There is a good way of saying no at work. There is a way of pushing back without ending your career. When I worked for Accenture there was a saying used all the time in the office when you pushed back on something or gently questioned your manager; “that’s a career limiting move”. I know it was mostly used as a joke and it was the first time – although far from the last – I heard it used in the workplace. Like all great jokes though, it had more than a grain of truth in it as you knew that saying yes was seen as the best way to get on and saying no really wasn’t. The good news is that was now 15+ years ago and this attitude is from another time and place. 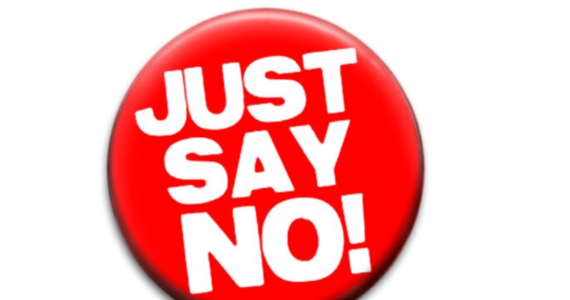 Now saying no is much easier – as hard as you may believe – until you simply start doing it. When you say, “sorry I can’t do that”, you can offer an alternative. You can offer to reprioritise some other work to make this new demand do-able. You can suggest a trade off; I can do task A but will need to delay or stop task B? You will be amazed how often your manager agrees straight away. Why? Because they had already forgotten they had asked you to do task B in the first place! We get asked to do stuff by our bosses because they have been asked for something by their bosses and they want to tell them it is in hand. They are on the case. In most organisations the original request is soon forgotten in a fog of multiple subsequent requests and a lack of focus between the urgent and the important. Even when your boss knows the priorities have changed they often neglect to tell you because it helps them that you are continuing to burn the midnight oil to get the impossible done – it makes them look good. They are running a tight ship. They always deliver under pressure. One thing I can assure you – from my own experience as the “yes-man” to my boss and as the person making the multiple, unthinking requests – only you can say no; only you can push back. The organisation will hardly ever – if ever – proactively or voluntarily say that they have we asked too much of you. They will rarely – if ever – take work off you to help you achieve a better work-life balance or just to be kind and fair. Even the best managers don’t care about your to do list (see more in principle four!) – they have enough problems managing their own. Once you start saying yes – it becomes expected. That is what you do; it is who you are. I have managed hundreds of people in my career and the people I have respected the most – not always the ones I’ve liked the most but the ones I’ve respected the most – are those who push back – constructively and professionally and said no. The fact that they value their own time and lives outside work forced me to value them more too. They made choices. They forced the issue with me. They made me think differently. Agreeing with your manager all the time is easy. Saying yes is painless – or so it seems. But all you are doing is storing up problems for yourself, your manager and your organisation. Saying yes all the time at work is a bad habit – an addiction – which attracts more requests, more demands and more stress. Like all bad habits and addictions, the first step to quitting is admitting that you have a problem. Be honest with yourself; how often do you just comply for a quiet life but end up regretting it? Next time you get a request at work, before you say yes like the knee responding to the reflex hammer, remind yourself of what’s important in your life; put the pictures of those special faces or places in your mind’s eye; think about the balance between your work and your home; and try saying no. Nobody will say it for you. Not at work. Not until you start to make different choices.